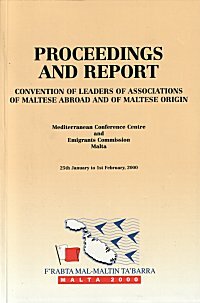 Conference of Leaders of Maltese Communities Overseas. Jan/Feb 2000. This is the full text of the Proceedings and Report. Rev. Fr Lawrence E. Attard O.P. Ilhna tal-Maltin fid-Dinja: X'Futur Hemm ghal Rabtiet ta' Kultura Hajja u Identità Etnika? Rev. Victor J. Camilleri O.F.M. Alfred A Zarb, Counsellor V.O.M. Rev. Victor J Camilleri O.F.M.